Mobile Phone manufacture HTC has made public their recently announced America-only EVO 3D handset is arriving in France. 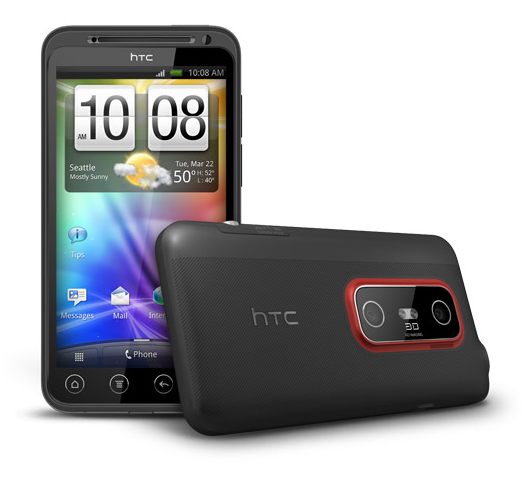 HTC unveiled the news from the @HTC_Fr Twitter account, in a tweet that reads: “Un #HTC Evo 3D pour la France ça vous dit ? Nous oui ! Et même qu’il garde le même nom Date de dispo non confirmée”. This is translated to: “A # HTC for France Evo 3D anyone? Yes we are! And it even keeps the same name Date unconfirmed available”. The HTC EVO 3D was unveiled at the Cellular Telecommunications and Internet Association event in the USA last week, which is the American equivalent to Europe’s Mobile World Congress event in Barcelona, from last month. The handset has the ability to show 3D media and in much the same way as LG’s Optimus 3D phone, which was first shown at MWC with One Mobile Ring covering the launch with video here and a review here. HTC’s EVO 3D 4.3-inch screen allows for video and pictures to be viewed without the need for any 3D glasses, along with being able to capture 3D media content from its twin 5 megapixel cameras. The mobile arrives running Android ‘Gingerbread’ 2.3, with a dual-core 1.2hz Snapdragon processor that’s capable of 3D HD 720p video capture that can be stored on its 4GB of memory. There’s been no news whether the mobile is due to arrive in the UK, although One Mobile Ring believes with the handset arriving in France, England isn’t too far off – geographically or figuratively.